Over the last 5 years or so, I have worked on many different food products. These range from custom cookie mix jars to unique alcohol mixers. On each of these 5 or so projects, I have had the good fortune (or bad luck, depending on the lens you look through) to be apart of the team driving the product from conception of the idea through either failure or big success. And even though the types of products varied greatly, I noticed that there are many uniformed truths that are consistent across the different projects. There are structures and frameworks that are best to follow and there is specific information and tidbits that if known can help to save large amounts of time and money. As I began to think up my next food product (more to come), I reflected on this and decided I would lay out each step that I needed to take to ensure that I was giving myself the best chance at succeeding. So I started to write it down. Not just the bullet points. I mean all of the nitty gritty details – how many prototypes to make, which type of feedback to get, what types of publications to reach out to, which types of package materials to avoid – and before I knew it, I had 150 Power Point pages full of notes. When I read back over my notes to myself, I realized that I had an entire business just in the knowledge I gained from my past experiences. So with that in mind, I am launching BoxedLaun.ch – an agency specifically designed to get food entrepreneurs from idea to market. 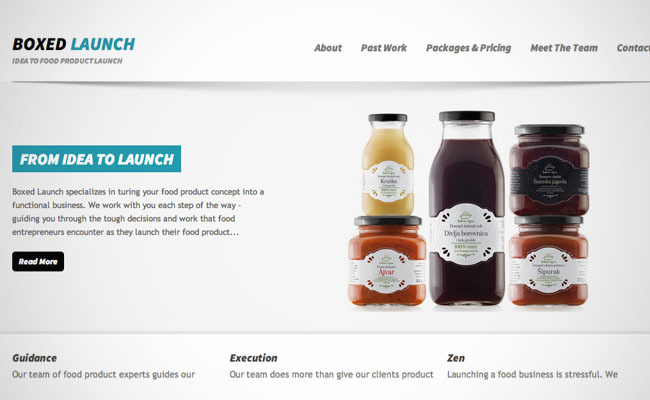 By using experiential knowledge of food product launches and by teaming up with other experts and creators, we have created a programmatic approach to launching a product that will take our clients from concept to functioning business in as little time as possible while ensuring they have as good a chance as any at success in the future.